In complete contrast to the welcome home, the South Korean side had, the Japan national side were welcomed back with a hero's greetings. 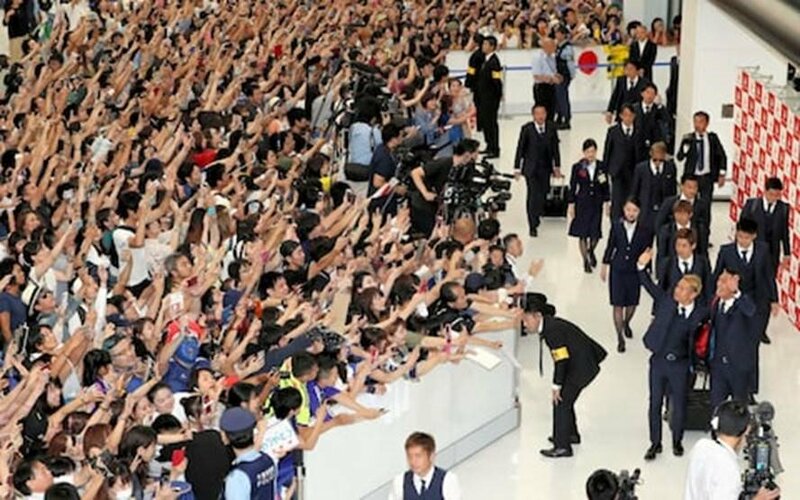 On the 5th July, the Japan side returned home flying into Narita Airport in Tokyo and were met by hundreds of fans. These fans were all in a joyful mood and there was not an egg in sight. The Japan side had poor preparations for the World Cup which even involved the sacking of coach Halilhodžić before the tournament kicked off. Although despite the low expectations they put on some impressive displays which involved a victory against Colombia and a dramatic last 16 exit at the hands of Belgium. The team did not only get many plaudits around the world the fans also did. This was not just down to their great support for the country but also the respect they showed the stadiums which involved helping to clean up after each Japan match. Overall the feature of the national side is looking good but whoever takes charge for the Asian Games in January 2019 will have a new Japan side to take forward after the retirement of Keisuke Honda and captain Makoto Hasebe.